When a wise man points at the moon, an idiot looks at his finger. This proverb, usually attributed to Confucius, contains a double meaning. It warns the inquiring to expect to be personally attacked for their observations and thoughts, but it also warns critics against substituting ad hominem attacks on people for criticism of their ideas. It seems that lately everyone is looking at the finger (Mindtimeshare and/or Alberto Garcia) and forgetting about the moon (the fraud). When Mindtimeshare is trying to enlighten timeshare owners about something important or amazing, the idiots are focussed on the unimportant, irrelevant details and missing the point. When Mindtimeshare is pointing to the real threat of fraud, the idiots are missing the point and focussing on the irrelevant details, like who is financing Mindtimeshare or if Alberto Garcia is still here or not; when in reality nothing has changed, no announcements have been made and, as a matter of fact, we have helped more timeshare owners than before and more police reports have been filed in the past months. But when the know-it-all, stakeholders, bounty hunters, rogue explorers and spokesmen of dubious companies arrive … and agree (because they are interested) that others do not look at the moon, they do not look at it. It is the populism. The mechanism that aims to attract the attention on the immediate, on the finger. It is then when the stupid people not only keep looking at the finger but also listen to the siren’s song from the populism. 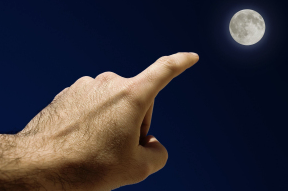 When you use a finger to point at the moon, you should not keep looking at the finger once you have sighted the moon, unless what you really want is that finger not pointing the moon anymore or unless what you really care about is destroying the finger to avoid pointing to the moon. This entry was posted in Bogus Holiday Clubs, Bogus resale companies, Companies closed down, fraud, Legal Services, Mediation services, Mindtimeshare, Newsletters, Warnings and tagged Bogus Claims Company, Bogus Holiday Clubs, Bogus resale companies, Cold Callers, fraud, Mindtimeshare, Newsletter, scams, Timeshare scam. Bookmark the permalink. what a completely weird post. Just ignore them and get on with what you do simple.